The reigning Big East player of the year is returning for one more season. 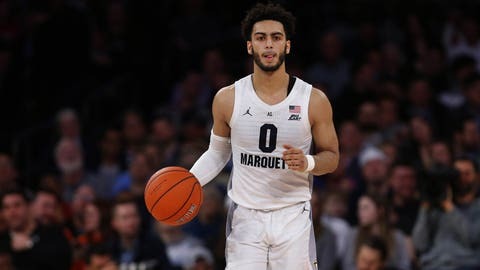 Sharp-shooting guard Markus Howard announced his plans to return to Marquette for his senior season Friday afternoon. Last season, Howard led the Big East in scoring (25.0 points per game), free throws (227) and 3-point makes(120). He also set career bests in rebounds (3.9 per game) and assists (3.9) while shooting 40.3% from downtown and 89.0% from the free-throw line. Howard was left with a bad taste in his mouth after fifth-seeded Marquette lost 83-64 to Ja Morant and Murray State in the first round of the NCAA tournament. With 1,955 points to his name through three seasons, Howard is 31 points away from becoming the top Golden Eagles scorer in program history. Jerel McNeal, who played at Marquette from 2005-09, tallied 1,985 points. Now that Howard is coming back, Marquette will return in 2019-20 with its same core from last season. The Golden Eagles will look for their first NCAA tournament win since 2013.